The goal of any outsourcing effort is normally to help the client company deliver a product to market that is faster, better and less expensive than they could build in-house. Sometimes the best way to achieve that involves multiple parties. In those cases, Milwaukee Electronics is often the bridge, working closely with both a design partner and the end customer. This is the case with the Portland facility and one of its industrial customers. The product is server/client units used to communicate fuel purchase and secure chip credit card data from the dispenser to a store. The design firm specializes in these products and developed a custom product for the end customer. Milwaukee Electronics is doing a full electromechanical box build with multiple printed circuit board assemblies (PCBAs) connected together. The original product had nine PCBAs, but a recent cost reduction design spin has reduced that to three PCBAs. The server unit is a rack-mounted network box and the dispenser unit is a sub-assembly mounted in the fuel pump. Volume production began at Milwaukee Electronics about five years ago. Volumes have increased from an average of 100 servers per month to 500 servers per month. While the design firm has primary responsibility for driving cost reduction efforts, the team at Milwaukee Electronics has supported those efforts in several ways. The Purchasing team has negotiated cost reductions from suppliers. The Manufacturing Engineering team has made recommendations on design changes to minimize assembly labor. For example, on the client unit the team recommended reducing the number of mounting brackets and that reduced labor. They also made recommendations on changes to the PCBA. Additionally, the team recommended changes to the way the metal supplier was packaging the chassis for shipment to reduce unpack time. The original design had specified far more protective packaging than was needed. The design firm developed the functional test and over time, with feedback from Milwaukee Electronics’ team, has streamlined the test as it became apparent that the product design was generating very little fallout. 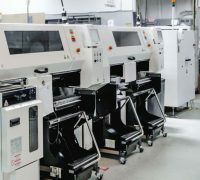 Milwaukee Electronics’ manufacturing team is now focused on improving throughput so that the higher volumes can be accommodated with no increase in floor space. The team has applied its Lean manufacturing training to re-layout the entire production flow. A supermarket has been installed in the manufacturing area to streamline material transactions. Point-of-use stocking and pull systems are being enhanced in the final assembly work cell. Additionally, the SMT equipment the facility has recently purchased enables offline feeder setup, which reduces setup time. “Our goal is to continuously find ways to capitalize on the equipment and training investments the Portland facility has been making over the last year, enhancing the value we are offering customers. The increased production in this project provides an excellent opportunity to demonstrate the benefits our expanded capabilities,” said Michelle McGillivray, Program Manager.